In the past, restaurants had to deal with clunky computer servers that provided complicated point-of-sales features and additional credit card processors. Now, with the advent of cloud-computing and faster wireless speeds, restaurateurs can use iPads to run POS systems. iPads are considerably better options for a variety of reasons. Their web-based systems reduce data clutter. Their small size makes it easier on waiters and owners alike. If you are a restaurant owner in need of a POS system for iPad, consider the entries in this post. Here are the best POS systems for iPad. Breadcrumb is a POS system for iPad designed specifically for restaurants. It has features that allow you to design table maps and update menu items. It also lets you keep track of your sales in real time. This works well in conjunction with their mobile app, which lets you monitor your restaurant activities on the go. Breadcrumb is on the pricier side, with one terminal going for $69 per month. You can however, choose to rent or buy their hardware. They also allow you to integrate with third-party payment processors like First Data and Global Payment. Breadcrumb is one of the best iPad POS systems if you can afford the monthly fee. Vend is another excellent POS system for iPad devices that allows you to be entirely hardware-independent. This cloud based POS system is 100% cloud based. However, you can still use it without internet as well. In addition, Vend offers great office functionality features, like an inventory management system and an in-store and online capable omnichannel sales approach. Vend also offers integration with many of the top third-party software. If you want to use a POS system for iPad that can work on and offline as flawlessly as your linen service, Vend is the solution for you. Square is one of the most popular POS options for small restaurants. It is a great option because it is almost completely free. The app is free to install and does not charge a monthly fee. New customers get free credit card readers included with their services, as well. The only charge you will have to pay is a credit card transaction cost, which is 2.75% per swipe. This is higher than most processors, which is the trade-off for Square’s free services. Fortunately, restaurants with higher transaction volumes can pay a flat $275 monthly fee, instead of paying per swipe. Square is a great iPad POS system if you do not want to pay monthly fees. ShopKeep is a top option for its simplicity. It is sleek, easy to use and completely cloud-based, like the best live answering service. This makes it ideal for quick-service restaurants and cafes. ShopKeep has features that allow you to customize menus and track inventory. You can also manage employee information and analyze market data. Compared to Breadcrumb, it has a slightly lower monthly fee at $49 a month. However, it does lack some of advanced features provided by Breadcrumb. Shopkeep is great for quick-service restaurants that would benefit from simplicity and easy access. Revel is a highly customizable system with various features and applications you can add-on. Some such features include ingredient inventory tracking, table layout design, franchise management and online ordering. Because of its customization options, Revel’s price can vary. This is its main strength, however. You can choose a package that fits your restaurant’s exact needs. If your restaurant is small, you can go for the bare minimum. If it is a franchise, you have a plethora of organization features at your disposal. Revel is one of the best iPad POS systems in this regard. 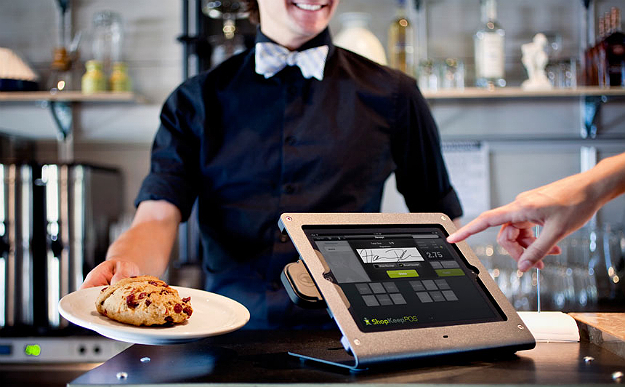 Your choice in POS system for iPad is going to depend on your needs as a restaurant owner. If your business is small, go for apps like Square, which are free to use. Large-scale operations however, need more comprehensive features. POS systems like Revel are more appropriate for situations like this. Evaluate the differences between each POS system for iPad and decide which is best for you.